Russia's best-known gay rights campaigner was arrested at Moscow's Domodedovo Airport yesterday. Nikolai Alekseev was boarding a flight to Geneva and had passed through passport control when he was arrested by Russian border police yesterday evening. According to UKGayNews, he was taken to a closed room at the airport but was able to contact a friend and news agency Interfax before his phone was taken away. He was not given a reason for his arrest and his whereabouts are not currently known. Three of his friends went to the airport to ask where he was, but were told by police he was not there. One of the policemen apparently suggested that he could be in the custody of the FSB, formally the KGB, headquarters on Lubianska Square in Moscow. 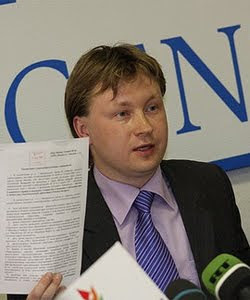 Moscow police say they have no record of Mr Alekseev in their database. The activist has been a tireless campaigner for equal rights and pride marches and there has been speculation that his arrest may be linked to his work. Yesterday, Russian gay rights campaigners applied for permission to hold a picket against homophobic Moscow mayor Yuri Luzhkov. GayRussia.ru, the country's leading gay website, is currently inaccessible.